Island dwelling birds are particularly vulnerable to invasive alien species, often resulting in the need for conservation intervention. The BirdLife partnership is embarking upon a new conservation project in the Marquesas Archipelago in the hope of conserving over 20 species of seabird from the impacts of invasive alien species. Over one third (34%) of all threatened birds are impacted by invasive alien species (IAS), with island dwellers being particularly vulnerable; 75% of threatened species on oceanic islands are estimated to be impacted by invasive species such as cats, mice and snakes (Medina et al. 2011, Cuthbert and Hilton 2004, Wiles et al. 2002). Pacific rats, feral cats and goats are present throughout the Marquesas Archipelago in French Polynesia, threatening a range of bird species. Cats are present on the mainland and goats are widespread, resulting in over-grazing and soil erosion and creating poor conditions for petrel burrow building. 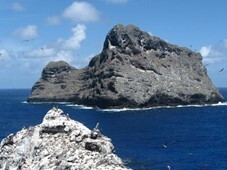 A project starting in 2016 by the BirdLife Partnership will involve the removal of IAS across nine priority islands, taking into account technical challenges and obtaining landowner and political support. The aim will be to secure predator free habitat for 22 species of seabird including three globally threatened—Tahiti Petrel Pseudobulweria rostrata, Phoenix Petrel Pterodroma alba, Polynesian Storm-Petrel Nesofregetta fuliginosa—and at least two globally threatened landbirds—Marquesas Ground-Dove Alopecoenas rubescens, Marquesan Monarch Pomarea mendozae. Cuthbert, R. J. and Hilton, G. (2004) Introduced House Mice Mus musculus: a significant predator of endangered and endemic birds on Gough Island, South Atlantic Ocean? Biol. Conserv.117: 471–481. Medina, F. M., Bonnaud, E., Vidal, E., Tershy, B. R., Zavaleta, E. S., Donlan, C. J., Keitt, B. S., Le Corre, M., Horwath, S. V.and Nogale, M. (2011) A global review of the impacts of invasive cats on island endangered vertebrates. Glob. Change Biol. 17: 3503–3510. Wiles, J. G., Bart, J., Beck, R. E. Jr. and Augon, C. F. (2002) Impacts of the brown tree snake: patterns of decline and species persistence in Guam’s avifauna. Conserv. Biol. 17: 1350–1360.